The Internet of Things (IoT) is changing the way industries around the world do business. And with recent advances in sensor platforms and intelligent analytic capabilities available from the cloud, the use of IoT has become even more mainstream. 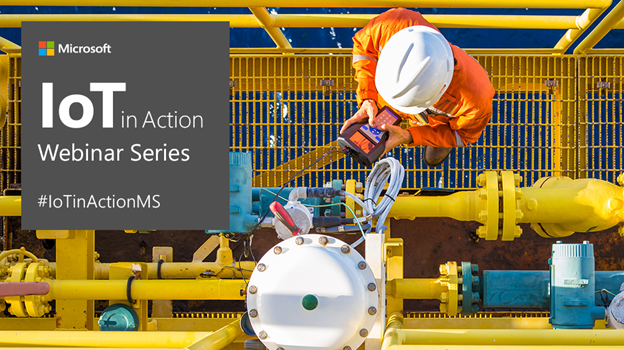 As we will highlight in Microsoft’s IoT in Action webinar series, there are many new and exciting ways that IoT solutions are being used across industries. In industries where there is so much data available, but not always the means to process and interpret it all, IoT solutions can have a huge impact. To start, IoT plays a crucial role in delivering a positive customer experience. Consider the healthcare industry. While being able to better track and predict illnesses can benefit hospitals and clinics, it also results in a more seamless journey for the individual. For example, individuals can use wearable technology to monitor their health and well-being beyond their heart rate and physicians can use this data to monitor patients remotely. This means each patient receives a more personalized, rewarding experience. Retail IoT solutions also revolve around using data to customize each experience to the individual shopper. While the insights gleaned from shopper data can help retailers improve their capabilities while reducing costs, it more importantly lets them create an engaging, frictionless shopping journey for their customers. Retailers can accomplish this using integrated sensor platforms, data fusion, and people and product interaction analytics. Attend the IoT in Action Retail Webinar and learn how to deliver your own personal, seamless, and differentiated customer experiences. The advances made with IoT solutions doesn’t stop there. By embracing a data-driven mindset, companies across all industries can also form valuable insights and quickly take action. From manufacturing and energy to healthcare, the benefits of using IoT-gathered data to drive your business are enormous. Companies can use real-time data to optimize production, predict and minimize downtime, boost product quality, and ultimately drive profit. Let’s go back to the previous healthcare example. Using IoT solutions, doctors can better gather patient data and track patterns that help them identify illnesses earlier. Not only does this improve the health of patients, but it can also help reduce long-term healthcare costs. Then there’s the manufacturing industry, where IoT-enabled predictive maintenance assists companies like Rolls-Royce in anticipating maintenance needs and avoiding expensive, unscheduled delays. Such IoT solutions allow companies to look at wider sets of operating data and use machine learning and analytics to spot correlations. They can then optimize their models based on this data and provide insights that might help improve overall efficiency or reduce costs. Companies can learn more about implementing smart manufacturing with IoT solutions during the IoT in Action Manufacturing Webinar. It doesn’t stop at just businesses though, entire communities can be positively affected. Tune in to the IoT in Action Security and Surveillance Webinar to see how IoT is impacting the digital transformation in public safety initiatives. Even with increases in IoT investment, there are still companies across multiple industries such as agriculture, energy, healthcare, manufacturing, government, retail, smart Buildings and smart Cities that aren’t sure where to go next. Their focus is determining how to tap new sources of data, how to drive insights and action, and how to implement IoT in a way that supports their customers and advances their bottom line. To aid in this learning process, we are providing partners and customers access to a new Microsoft IoT in Action webinar series. The aim of these live and on-demand webinars is to show what’s possible with IoT while also educating on how to do it. Filled with IoT thought leadership and technical know-how shared by industry pioneers from Microsoft and our partners, each webinar is crafted to inspire development across the IoT partner ecosystem and help you better meet customers’ needs. The IoT in Action webinar series includes industry spotlights, which are 60-minute webinars focused on a target industry. IoT experts from Microsoft and our leading partner companies in the industry will lead the webinars with highlight partner solution examples to help you understand the evolving technologies, innovative solutions, and changing business models in the dynamic IoT space. Register for these live webinars so you can get inspired by industry leaders and begin implementing new IoT strategies in your business today.